Aftonbladet has a new interview with George Lucas conducted by Jens Peterson. Special thanks to Björn Aspernäs and TheForce.Net. "We are not Hollywood," states George Lucas, a self-made millionaire who has built his own cinema-center at the Skywalker Ranch. Soon 700,000 people will have seen the new "Star Wars" movie. George Lucas, the man behind the space saga, has had his home and film studio in a valley north of San Francisco for more than twenty years. From there, he redrew the map of movie making with "Star Wars." That is where he is creating the finale of the series - plus a new Indiana Jones episode. The winding road to the Skywalker Ranch goes north from San Francisco and across the Golden Gate Bridge then past the San Quentin prison and off towards the coast. There, George Lucas bought a large land-area using the money he made from "Star Wars: A New Hope." He built houses made to look as if they are from the 19th century. He gathered talented people there to expand his universe of movies and games. The special FX company Industrial Light & Magic (ILM) grew from this to become the leader of the industry, and Lucas was involved in creating Pixar, which went on to produce movies such as "Toy Story," and "Monsters, Inc."
2) He doesn't want to do "Star Wars." Lucas: "The kind of movies I have made aren't the kind I want to do. It's an odd little thing in life". 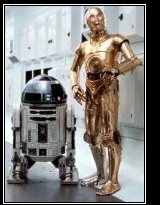 Nevertheless, he has named his headquarters "Skywalker Ranch.” When I walk through the doorway, models of the droids C-3PO and R2-D2 greet me. In the library, you can find objects from every film Lucas has worked on. George Lucas is dressed in a cotton shirt and blue jeans. His own uniform looks closer to a vine-farmer than a science-fiction legend. But then, he grew up on a walnut farm. We meet in the main building where he has his own movie theater. It has digital showings, and this was also where the THX audio system was developed. Peterson: "You have located yourself far away from Los Angeles?" Lucas: "It's always annoying for San Francisco filmmakers to be mixed up with Hollywood. We are very different; we have always disliked Hollywood. It's a very tense relationship." Peterson: "What is the difference?" Lucas: "Our movies are better! [laughs] We are more personal, more involved. It may look Hollywood to you, but we are definitely not Hollywood. I let them distribute the finished movies. That is all." Peterson: Are you looking forward to completing the Star Wars-series, or has it become a burden?" Lucas: "I enjoy doing it. I guess the burden lies in my desire to make other things, and that I have become trapped in a certain style and genre. I can't detach myself. I enjoy the world of Star Wars, but there are so many other things I would like to do. It will be more avant-garde. Star Wars is as far away from myself as a person as you could ever get." Peterson: "But how would a personal George Lucas-movie look? What movies are there you wish you had made?" And so he begins to speak of another matiné hero. At least: as powerful financially. Lucas: "I wanted to see a movie such as 'Raiders of the Lost Ark', but I didn't want to make it myself. So I asked Spielberg, and those kind of movies are what he likes to direct. Peterson: "I understand you are starting the next Indiana Jones?" Lucas: "All I need to do with Indy is to create the story and select the script-writer. I have come up with a plot that both Steven [Spielberg] and Harrison [Ford] like, so now I just have to get the writer going and then I'm done. Steven Spielberg and Harrison Ford are now waiting for Frank Darabont to write the script based on Lucas's story. When you are reading this, George Lucas is sitting at his desk at the Skywalker Ranch. Lucas: "I am writing both Episode III and Episode IV in two different series. The third Star Wars and the fourth Indiana Jones." They are both scheduled for release in 2005. Peterson: "'The Fellowship of the Ring' was a big success and it raised the bar for adventure movies and special effects. What did you think of it?" George Lucas smiles, "That is the secret of filmmaking. Go as far away from Hollywood as possible."